The placenta is the organ that mediates transport of nutrients and waste materials between mother and fetus. Synchrotron X-ray fluorescence (SXRF) microanalysis is a tool for imaging the distribution and quantity of elements in biological tissue, which can be used to study metal transport across biological membranes. Our aims were to pilot placental biopsy specimen preparation techniques that could be integrated into an ongoing epidemiology birth cohort study without harming rates of sample acquisition. We studied the effects of fixative (formalin or glutaraldehyde) and storage duration (30 days or immediate processing) on metal distribution and abundance and investigated a thaw-fixation protocol for archived specimens stored at −80 °C. 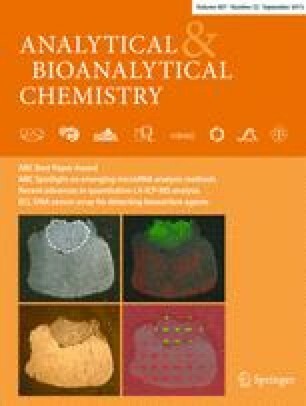 We measured fixative elemental composition with and without a placental biopsy via inductively coupled plasma mass spectrometry (ICP-MS) to quantify fixative-induced elemental changes. Formalin-fixed specimens showed hemolysis of erythrocytes. The glutaraldehyde-paraformaldehyde solution in HEPES buffer (GTA-HEPES) had superior anatomical preservation, avoided hemolysis, and minimized elemental loss, although some cross-linking of exogenous Zn was evident. Elemental loss from tissue stored in fixative for 1 month showed variable losses (≈40 % with GTA-HEPES), suggesting storage duration be controlled for. Thawing of tissue held at −80 °C in a GTA-HEPES solution provided high-quality visual images and elemental images. The online version of this article (doi: 10.1007/s00216-015-8861-5) contains supplementary material, which is available to authorized users. This work was supported in part by the following: P20 GM104416 from the National Institute of General Medical Sciences, P01ES022832 and P42 ES007373 from the National Institute of Environmental Health at the NIH, and RD83544201 from the Environmental Protection Agency. This research used resources of the Advanced Photon Source, a US Department of Energy (DOE) Office of Science User Facility operated by the DOE Office of Science by Argonne National Laboratory under Contract No. DE-AC02-06CH11357.